The politically aware, middle-income mainstream is the mass market that advertisers must tap into, Tony Regan advises. Politicians have spent recent weeks talking about their commitment to Britain’s "hard-working families up and down the country" – the middle ground of voters who will have influenced this election result more than any other group and more than ever before. The major parties recognise the power held by this modern mass market, but how many brands focus on that same middle ground? Many advertisers believe that a focus on niche – not mass – audiences will grow their brands more successfully. Still more believe that "upmarket" consumers represent their best source of revenue. So while politicians are grappling with the erosion of old boundaries between social classes that is creating a new enlarged mainstream, many brands and agencies still instead prefer the apparent certainties of ABC1 and C2DE. At Trinity Mirror, we know a great deal about the "hard-working families up and down the country". The national, regional and local news titles we represent have more than 2,000 journalists throughout Britain, which means that we truly have our finger on the pulse of the whole nation, not just the London bubble and the Westminster lobby. 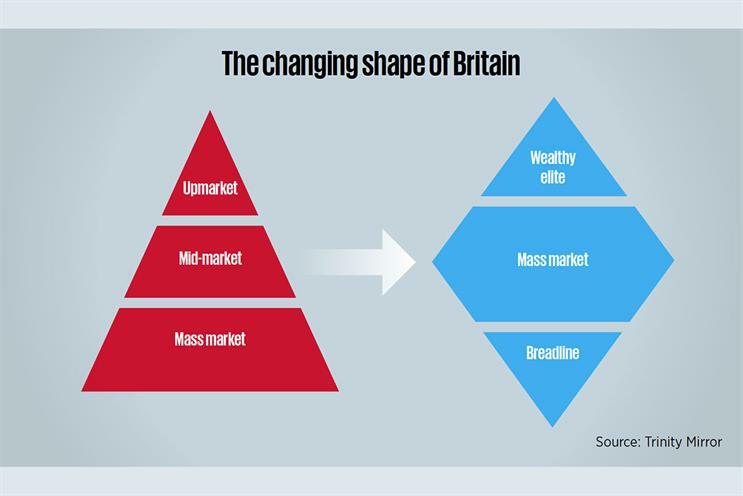 We think the views and interests of the mainstream are becoming a "modern mass market" that we call Modal Britain (after the statistical "mode": the people there are most of). Over the past six months, we have been investigating the changing shape of society and the emergence of that modern mass market. Its roots lie in social transitions that have taken place during the recession, during the digital revolution and dating back to the Thatcher and Blair years. We now live in a service economy, not an industrial one; and while the gap has widened between the richest and poorest, there has at the same time been a flattening of historic differences in the middle. Old boundaries between social classes have melted away to reveal an enlarged mainstream whose values and attitudes have converged, who no longer identify themselves on either side of a social divide defined by white collar and blue collar or by social advantage and disadvantage. Our research defines Modal Britain – with middle incomes but not "middle class" – as empowered, informed and values-driven. They are motivated by strongly held beliefs, desire for betterment and a sense of belonging. They are politically engaged (almost two-thirds are interested or very interested in politics) and nine out of ten have followed the election, predominantly via news brands. If this has been the "social election", for Modal Britain those conversations have largely been with their close personal networks and mostly face-to-face (just like their social interactions when discussing advertising). Around a fifth of them went into the election period undecided about their voting intentions. Less attached to inherited class politics, 74 per cent focused on finding a party whose values matched their own and which would be the best choice for the country, not just for themselves. Ignore Modal Britain and you ignore the new mainstream that decides which brands and trends succeed and is now electing the new government.